Argentina finds itself in a strange position since the U.S. Supreme Court rejected its appeal Monday to take a case in which a small group of creditors is suing this country for full repayment: it is on the brink of default even though it is one of the countries in the world that has done the most to dig itself out of debt. 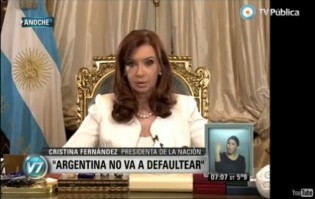 As a sign of Argentina’s willingness to repay its bondholders, President Cristina Fernández introduced a bill for a new swap of the foreign debt held by “holdout” creditors who refused earlier restructurings after the country’s late 2001 default. Vulture capitalist Paul Singer has hundreds of millions of dollars at stake in his legal battle with Argentina over the country's 2001 debt default. When Argentina defaulted on its national debt in 2001, U.S. hedge funds swooped in to buy the nation's bonds at pennies on the dollar, confident they would eventually prevail in the U.S. legal system and force the country to pay out in full. The fate of countries with major debt problems is at stake in federal courts in New York, which are to decide in April whether or not they accept Argentina’s proposal to the bondholders who rejected two restructurings of sovereign debt.